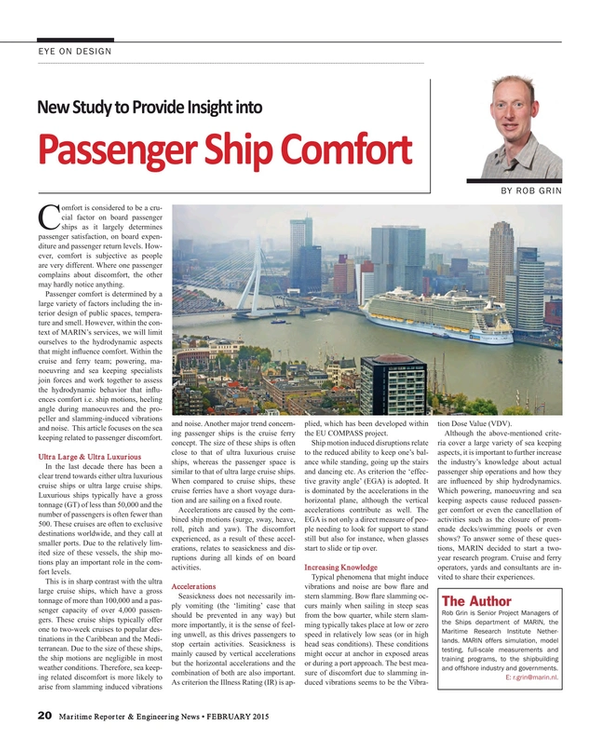 Comfort is considered to be a crucial factor on board passenger ships as it largely determines passenger satisfaction, on board expenditure and passenger return levels. However, comfort is subjective as people are very different. Where one passenger complains about discomfort, the other may hardly notice anything. Passenger comfort is determined by a large variety of factors including the interior design of public spaces, temperature and smell. However, within the context of MARIN’s services, we will limit ourselves to the hydrodynamic aspects that might influence comfort. Within the cruise and ferry team; powering, manoeuvring and sea keeping specialists join forces and work together to assess the hydrodynamic behavior that influences comfort i.e. ship motions, heeling angle during manoeuvres and the propeller and slamming-induced vibrations and noise. This article focuses on the sea keeping related to passenger discomfort. In the last decade there has been a clear trend towards either ultra luxurious cruise ships or ultra large cruise ships. Luxurious ships typically have a gross tonnage (GT) of less than 50,000 and the number of passengers is often fewer than 500. These cruises are often to exclusive destinations worldwide, and they call at smaller ports. Due to the relatively limited size of these vessels, the ship motions play an important role in the comfort levels. This is in sharp contrast with the ultra large cruise ships, which have a gross tonnage of more than 100,000 and a passenger capacity of over 4,000 passengers. These cruise ships typically offer one to two-week cruises to popular destinations in the Caribbean and the Mediterranean. Due to the size of these ships, the ship motions are negligible in most weather conditions. Therefore, sea keeping related discomfort is more likely to arise from slamming induced vibrations and noise. Another major trend concerning passenger ships is the cruise ferry concept. The size of these ships is often close to that of ultra luxurious cruise ships, whereas the passenger space is similar to that of ultra large cruise ships. When compared to cruise ships, these cruise ferries have a short voyage duration and are sailing on a fixed route. Accelerations are caused by the combined ship motions (surge, sway, heave, roll, pitch and yaw). The discomfort experienced, as a result of these accelerations, relates to seasickness and disruptions during all kinds of on board activities. Seasickness does not necessarily imply vomiting (the ‘limiting’ case that should be prevented in any way) but more importantly, it is the sense of feeling unwell, as this drives passengers to stop certain activities. Seasickness is mainly caused by vertical accelerations but the horizontal accelerations and the combination of both are also important. As criterion the Illness Rating (IR) is applied, which has been developed within the EU COMPASS project. Ship motion induced disruptions relate to the reduced ability to keep one’s balance while standing, going up the stairs and dancing etc. As criterion the ‘effective gravity angle’ (EGA) is adopted. It is dominated by the accelerations in the horizontal plane, although the vertical accelerations contribute as well. The EGA is not only a direct measure of people needing to look for support to stand still but also for instance, when glasses start to slide or tip over. Typical phenomena that might induce vibrations and noise are bow flare and stern slamming. Bow flare slamming occurs mainly when sailing in steep seas from the bow quarter, while stern slamming typically takes place at low or zero speed in relatively low seas (or in high head seas conditions). These conditions might occur at anchor in exposed areas or during a port approach. The best measure of discomfort due to slamming induced vibrations seems to be the Vibration Dose Value (VDV). Although the above-mentioned criteria cover a large variety of sea keeping aspects, it is important to further increase the industry’s knowledge about actual passenger ship operations and how they are influenced by ship hydrodynamics. Which powering, manoeuvring and sea keeping aspects cause reduced passenger comfort or even the cancellation of activities such as the closure of promenade decks/swimming pools or even shows? To answer some of these questions, MARIN decided to start a two-year research program. Cruise and ferry operators, yards and consultants are invited to share their experiences. Rob Grin is Senior Project Managers of the Ships department of MARIN, the Maritime Research Institute Netherlands. MARIN offers simulation, model testing, full-scale measurements and training programs, to the shipbuilding and offshore industry and governments.